This page of the Primary Documents section of the website collects together archive source documents originating in the years following 1919. Documents listed here include the various U.S. peace treaties with the post-war governments of Austria, Hungary and Germany. 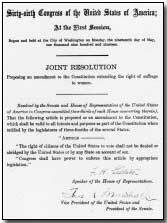 Also available is the text of the U.S. 19th Amendment which saw American women's right to vote ratified by Congress. A 'whizzbang' was a high-velocity, low-trajectory shell that made a shrill approach noise and then a sharp explosive report.